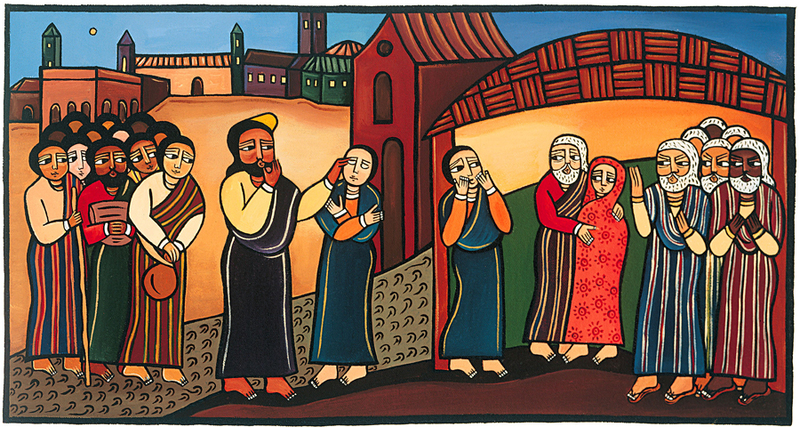 Who is really blind in today’s gospel reading (John 9)? The man, the people around him, his parents, the Pharisees? My quick answer: all of them! The man was blind – but he had become invisible to everyone who saw him day after day. Their blindness was one of ignoring him. They passed him by every day, they hardly noticed him. Have you experienced that, in the street corners of Portland? On some corners I see the same person day after day, and it is easy to get suspicious and to simply roll up your window and hope the light won’t be long to change. This is the blindness of looking the other way. There is the blindness of fear and conformity The parents were not blind in recognizing him, but they were blinded by the authority of the Pharisees and they shied from saying anything that would cause them trouble. They were the typical cowards, afraid to speak out. They are everywhere: in every totalitarian country, in every corporation, in the church, in the neighborhood! People are afraid to speak, afraid that they would lose their job or their privileges, or even land in jail or disappear! And so we come to the Pharisees. Theirs is the blindness of power. (We say someone is “blinded with power.”) This chapter is the most detailed description of the kind of controversy that Jesus faced with the Pharisees every day. We see them carry out an inquisition! No wonder the parents were afraid to say much to this inquisition. They have many weapons in their arsenal, and their greatest weapon was Moses – not only Moses the giver of the laws that governed their daily life, like Sharia law in some Muslim societies; but Moses who spoke with God! Today we know that Moses did not write the first books of the Bible, we know that the laws that governed life in Israel were created by priests over the centuries. So today the Moses weapon wouldn’t carry much weight. But in that day, it was big. The Pharisees inadvertently spoke the truth at the same time as they were attacking the man. They accused him of being Jesus’ disciples, whereas they were Moses’ disciples! This was one of the big ideas in John’s Gospel. Back in chapter 1, we read: For the law was given through Moses; grace and truth came through Jesus Christ. This is indeed the central issue, the choice that the Gospel puts before us: Law OR grace and truth. The Pharisees were correct: they were disciples of the Law. 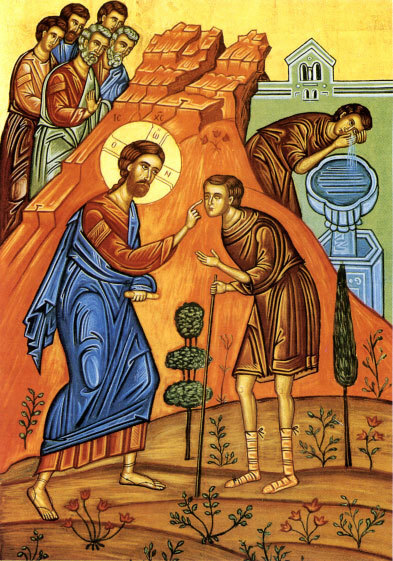 The blind man became a disciple of Jesus, a disciple of grace and truth. He experienced grace in healing and his eyes were opened not only to physical reality but to truth. While they remained in their spiritual blindness, the man was healed physically and spiritually. His spiritual blindness was lifted gradually in the narrative. His spiritual blindness was the same as we all have. It’s the blindness of not knowing. For example, he made the statement that God does not listen to sinners! So deeply had he been brainwashed by the religious teachings of his time that he repeated such lies without questioning. He wasn’t that different from the apostles when they asked who sinned that this man had been born blind! Son of Man – explicitly revealed by Jesus himself. Notice Jesus’ absence from the middle 2/3 of the chapter! He sends the man to wash in the pool of Siloam – which means Sent – and then leaves the scene until the end of the chapter when he finds the man he had healed. In the middle 2/3 of the chapter, the man is alone to face the Pharisees and everyone else who questioned him. He was sent! And he was sent alone. This was the growing experience he needed before Jesus would reveal himself to him as Son of Man. Many times we experience the distance of God in our lives. I believe God moves to the background to allow us to grow in grace and truth. The man reached the limits of his own wisdom, and then Jesus came back into the picture to finish the job of opening the man’s inner eyes. A Catholic Priest, a Baptist Preacher and a Rabbi would get together two or three times a week for coffee and to talk shop. One day, someone made the comment that preaching to people isn’t really all that hard, a real challenge would be to preach to a bear. So they decided to do an experiment. They would all go out into the woods, find a bear, preach to it, and attempt to convert it to their religion. Reverend Billy Bob the Baptist, spoke next. He was in a wheelchair, had one arm and both legs in casts. ‘WELL, brothers, you KNOW that we Baptists don’t sprinkle! I went out and I FOUND me a bear. And then I began to read to my bear from God’s HOLY WORD! But that bear wanted nothing to do with me. So I took HOLD of him and we began to wrestle. We wrestled down one hill, UP another and DOWN another until we came to a creek. So I quickly DUNKED him and BAPTIZED his hairy soul. And just like you said, he became as gentle as a lamb. We spent the rest of the day praising Jesus. Hallelujah! Categories: Sermons | Tags: blindness, conformity, healing of blind man, Pharisees | Permalink. As usual your interpretation of scripture is fresh and relevant. I’m sure your people are lucky to get these sermons. I’ve finished my present series and will start a new bible blog project Monday. Any ideas? I haven’t had a chance to read your summaries and general statements on Genesis and Mark. But as you know I’ve been waiting anxiously to read them. I haven’t done much writing myself lately, been busy. Busy also today through Monday! I look forward to commenting on what you’ve written. Stay in touch, brother! By the way, Mike, I’ve developed a huge interest in Dead Sea Scrolls and the Enochic writings – focus of much scholarly research presently. Do you have any interest in those areas? I want to read your Mark summary and look also at what you’ve written in past about the Son of Man in Mark. Son of Man is hot topic in Enochic scholarship these days!